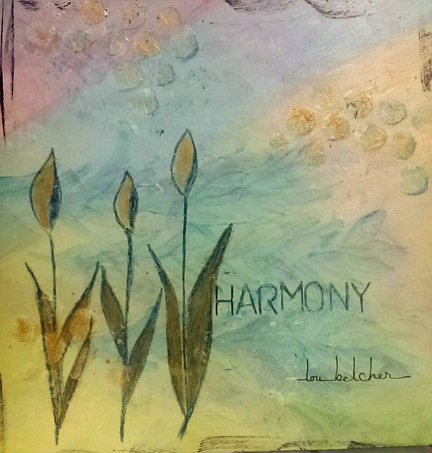 Thanks to Joanne and to Amber for proposing the word Harmony. I almost posted a photo of the boys for harmony because so many times I catch them sleeping with one’s head on top of the other. However, I thought a little longer, and there are so other times when they are chasing each other faster than I can attempt to catch them. I’m not so sure they aren’t harmonious during those chasing times to make it fun. It might be a game and they may have rules that they are following. I guess we just don’t know what this word might mean in any given situation. Hope you have a harmonious day. This entry was posted in art and tagged harmony. Bookmark the permalink. That one made us smile and think of Spring. Have a tremendous Thursday. That one is very pretty and soothing. Heehehehehe We HOWL in Harmony… Just sayin. This is beautiful. Your work is really evolving. I love watching the evolution. How does it feel to you? Harmonious wouldn’t work all that great with us kitties here either! I think your final idea was better! Our Mommy just loves these. This one is great too, she says. She wishes she could buy them all! Yes, we think we kitties are more yin/yang than harmony (Yin = peaceful, yang=chasing. Or something like that!) It’s a beautiful piece. Love the color palette! Oh this is a nice one! Again, really like the painting Lou! We posted about our painting you did of Inka in our Tunnel Tuesday for this week. Thanks again Lou, I really appreciate everything.